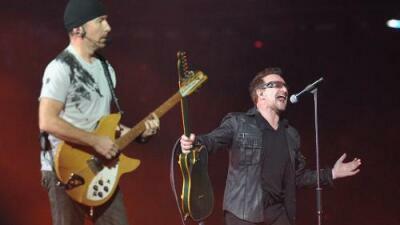 U2 performed at Bonnaroo on Friday (June 9) in Manchester, Tennessee. Before singing, "One Tree Hill," Bono dedicated the song to Lily Cornell, the daughter of Chris Cornell. Bono commented about Cornell's recent passing, and said…"Her dad had an epic heart." The song from their 1988 album, The Joshua Tree, was originally written for a friend of the band that passed away in 80's. The 4 day festival that covers 700 acres just 60 miles south of Nashville has hosted an array of huge stars, but this was the first appearance by U2. The crowd was left with the impression that it may not be the last. Throughout the 2 hour headlining show, the band commented about the size of their audience. Bono ended the show by saying that it had been an "Unforgettable experience" and asked the crowd…"Did we make a big mistake not coming here before? Can we come back again?" Although officially, this year's crowd numbers aren't in yet, the festival has touted over 80,000 in the past. U2 also honored women during their performance of "Ultraviolet (Light My Way)," the faces of famous women through history flashed behind the band, from Rosa Parks to Angela Merkel to Michelle Obama. U2's current tour: Joshua Tree 30th Anniversary Tour. A quote from Bono on stage at Bonnaroo: "Some people may think Martin Luther King Jr.’s dream is dead, but not at Bonnaroo tonight." Bono said of modern social justice. "Maybe the dream is just telling us to wake up."